One of the most memorable road trips was 1990. I was stationed in Germany in the late 80’s and early 90’s. The cold war was in flux, we still had Soviet tanks ready to rush the Fulda Gap, Checkpoint Charlie was the gate from the Island of Freedom known as West Berlin, and Aircraft stood on alert ready to respond to what was sure to be the end of mankind as we know it. There were still numerous living vets from WWII who would talk about the war, mostly the moments outside of combat. Didn’t matter if it was an American, German, patriotic citizen of Luxembourg, or friendly Belgian, I could even get arrogant French vets to open up a bit. My interest had grown about the history of the war and since I had a grandfather who had fought and was wounded at the Battle of the Bulge, I really wanted to see the battle grounds in Luxembourg and Belgium. I headed out early on a rare day off with a buddy Kent Wilkinson. Kent was a Senior NCO and I had just made NCO status. The respect was there. I have always had the ability to keep professional relationships and private life separate. He was a great leader who would later make Chief. The road trip would be the last time I would see him for several years. I did serve under his brother on a QRT (quick reaction team) in Desert Storm, but I would run into Kent many years later when I was playing drums for Narrow Road. We cleaned off chow at the mess hall early and headed towards Luxembourg in my Suzuki Samurai. Our first stop was in the tiny museum dedicated to General George S. Patton. It was honestly one of the best collections of WWII history I have ever seen. Both Kent and I took our time and quietly walked through the museum, stopping every few moments to discuss the displays. Not sure of his intent I politely answered back, “Yes we see them”. Kent and I both went on alert. Both of us were having flashbacks to all those Armed Forces Network commercials about terrorism and the movies we were forced to watch in the base theater every year emphasizing the danger of militant extremist kidnapping us and then leaving us for dead in some barn in the middle of the Eifel Mountains. “Sure” I responded, probably surprising Kent. I was in the middle of a horrible divorce and really didn’t have anything to lose. Kent was single, so he had a whole life ahead of him. I figured that balanced us out. Over the next few hours we were given the “behind-the-scenes” tour of the whole museum. It turned out the man taking us around was the owner and curator of the museum. He knew every weapon, canteen, vehicle, etc of the place. Most of it he had collected on his own. When he found out my grandfather was a t Bastogne, the day got even better. We eventually made it to the “Nuts” Museum, where we received first class treatment and had a guided tour. The Bastogne War Museum covers the Second World War, from the fall of 1944, and then focuses on the Battle of the Bulge.I found it interesting that not only key events of the battle were covered, but also the day in the life of the men who endured the harsh conditions with death constantly knocking on the door. In addition, the museum also provides a forgotten element, how the civilians lived during the German occupation, then the battle itself, and post hostilities. After the tour we then left to see a few more battlefields and then treated to a feast in a local gaust haus/ tavern/ pub. On tap was a local wine from the monastery and on the table was horse. Yes, horse and being the polite guest I consumed. Not sure what the big deal is about eating horse meat, it was pretty good. Having a local guide that isn’t going to kill you, traveling with someone who has an equal level of interest in learning, and having the desire to see new things is the perfect ingredient for day trips like this. I wish I had pictures from the journey, but they have been lost or destroyed (the ex) along the way, but I still have my memories and experience of the adventure. I haven’t spoken to Kent in years, but think of this trip often. 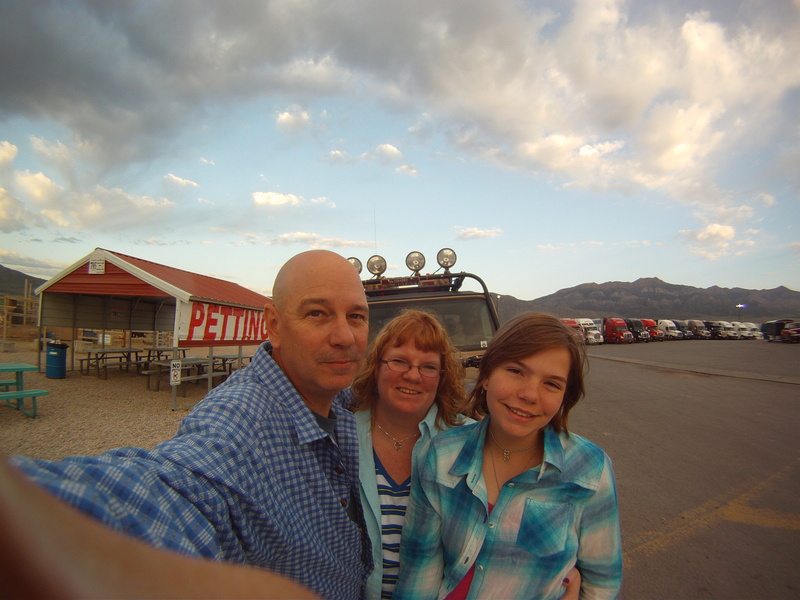 This entry was posted in Adventure Aggregate, Overlanding and tagged 'Cold War, 4x4, adventure, adventure iq, aev, at, bastogne, bonners ferry, border crossing, canada, Eifel, expedition, glacier national park, huckleberry pie, jeep, jk, Kent Wilinson, montana, northwest overland rally, nuts, nuts museum, nwor, overland expo, patton, road trip, spangdahlem, travel, washington on May 28, 2014 by adventureiq. DISCLAIMER: One of the things we pride ourselves on is HONEST feedback. It is purely based on our experience alone. I’ve lost sponsors and partnerships through honesty. My position is to give our audience what we feel are fair evaluations of gear we test. If it’s on my rig- I HIGHLY recommend it for yours. We don’t usually dislike a product so quickly on this level. We are careful to select products from several weeks if not months of research. We make it a habit to talk to other users, check out the blogs, and even speak to sales or customer service reps about the product before we pull the trigger and throw it on the rig, put it in a pack, or try it on the trail. For someone who isn’t toting an ice chest and simply need a better way to organize sports gear, groceries, etc it’s a good concept. 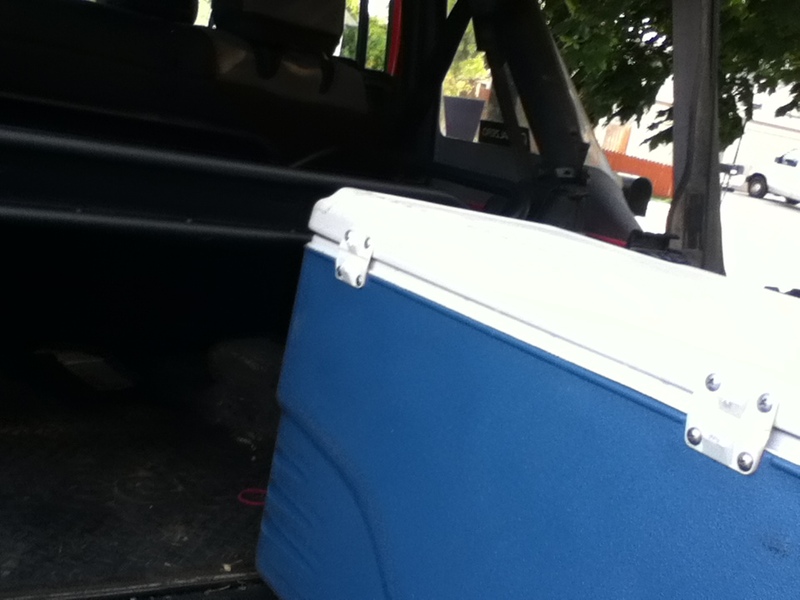 The storage rack features a fairly sturdy steel tray that mounts in the rear cargo area. Putting it together wasn’t that difficult and I did it in about an hour with no drilling required. One of the things that made it slightly difficult with my soft-top and impossible on a hard top is the tubular brackets that go on the roll bar.The Allen bolts faced outward and I had to remove the rear window on each side to get to the bolts. The concept of moving the tray out-of-the-way when not in use is unique in this model. 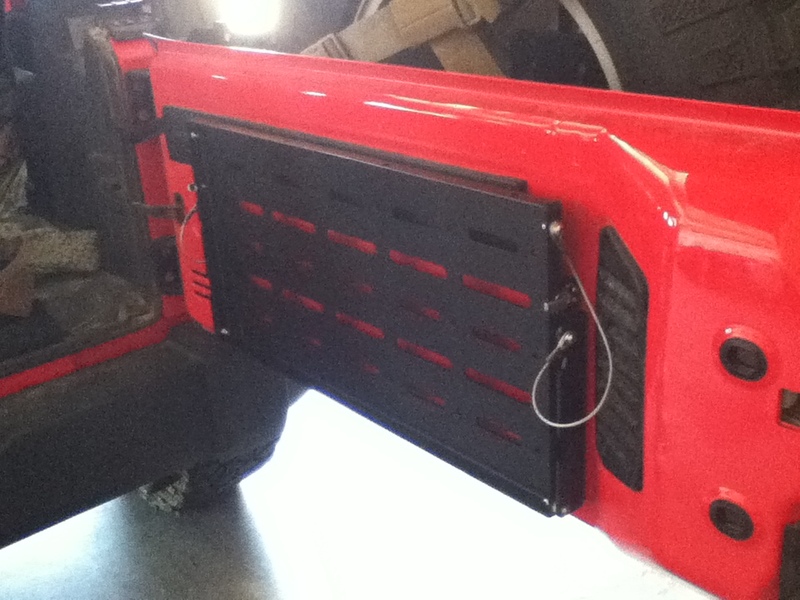 On the bottom of the tray are two spring clips and a single gas strut allowing the rack to tilt forward providing easy access to gear located underneath. One problem though is the hooks don’t fully engage and a simple run around the block after installation and several attempts to adjust proved to be a waste of time. The thin bar at the bottom would create an annoying rattling on dirt roads. 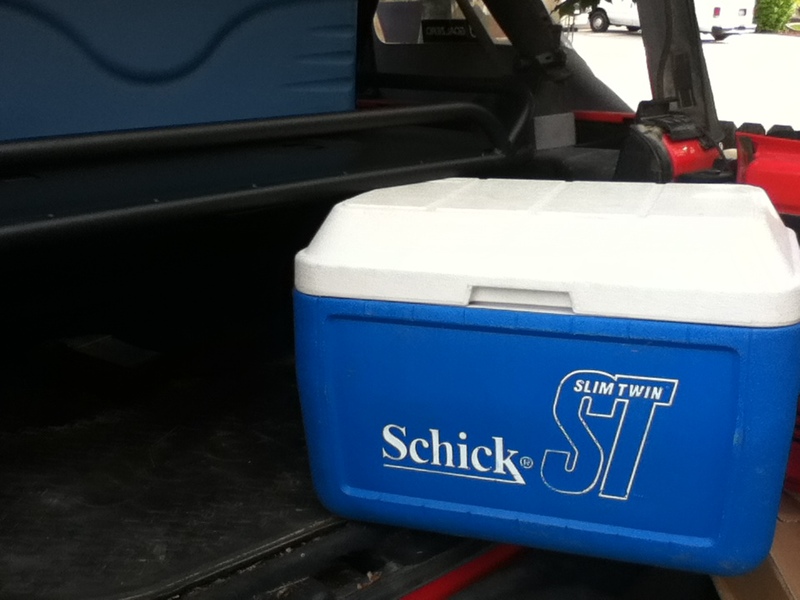 I had even thought about the possibility of placing the ice chest on top of the rack and quickly dismissed the idea when I realized I would have five days of food and drinks rocketing towards all passengers in the case of an abrupt stop. 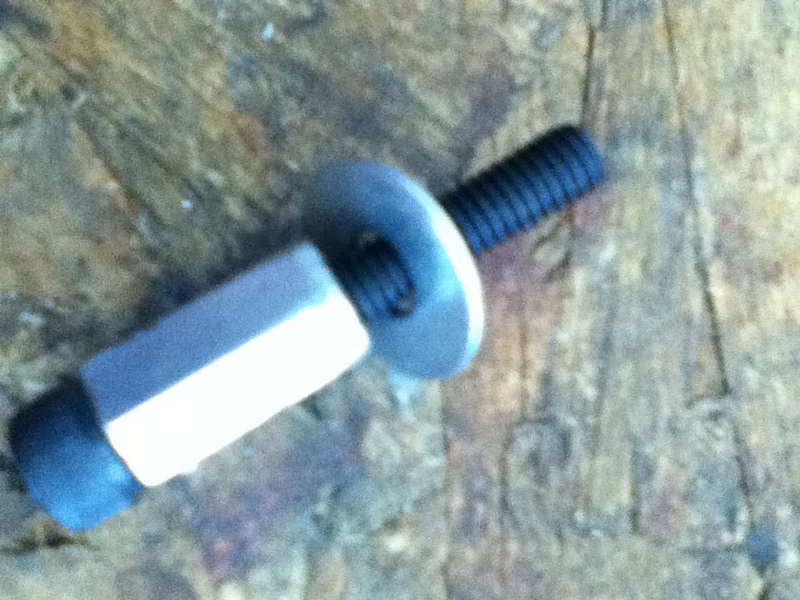 The only bolt-down points are on the roll bars and it does not tie into the body or the frame at any other point. If this was for a grocery-getter or soccer mom Jeep I wouldn’t hesitate to put it in. It does help to organize suburban adventures on Saturday morning and payday grocery runs. It does provide a bit of security and for photographers wanting to store gear out of sight it could be a benefit. We paid $240 for our set up and thankfully the company we ordered from is going to allow us to send it back based upon the product not meeting the expectations we outlined. Again, the concept is great, and other gear we have from Rampage has fared very well to excellent. The major disappointment here is based on the initial expectations not being met. Show me a Jeep guy that at some point doesn’t throw an ice chest full of grub and suds in his rig for a few days of fun on the trails. 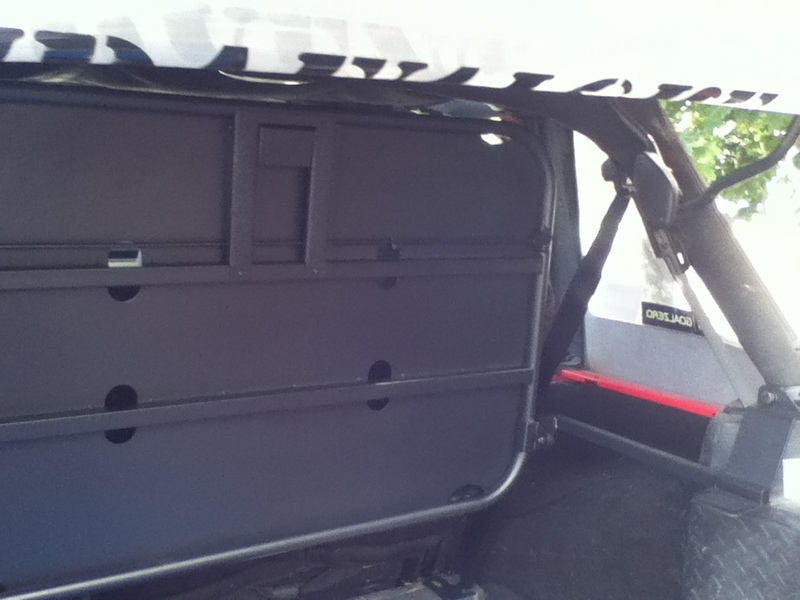 This entry was posted in Overlanding, Product Reviews and tagged diy, gear review, ice chest, jeep, Jeeper, jk, jku, mall-crawler, outdoors, quadratec, rampage, rampage sports rack, review, sports rack, wrangler on May 27, 2014 by adventureiq. The Teraflex Tailgate Table has been on my wish list since I saw Roger Mercier of Overland Frontier fixing breakfast at the Overland Expo using a drop table like this. 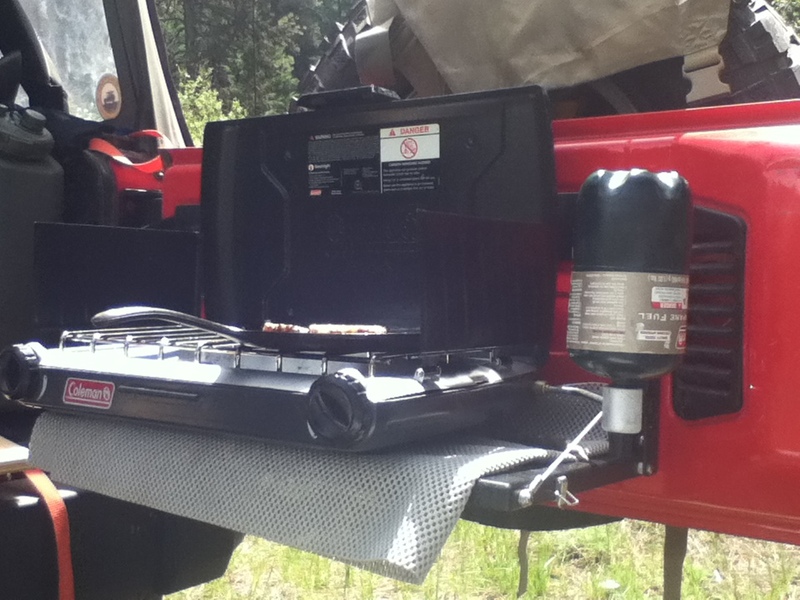 This is the perfect accessory for any Jeep enthusiast needing a spot to make a quick sandwich, poor a glass of wine for your “glamping” companions, or even repair an RC car on. I used mine for a cooking surface for my two-burner stove, however I’m not sure I can recommend this due to the proximity of grease, fire, gas cans, and the rest of my rig. For everything else kitchen related, it is perfect! The install took about 45 minutes. 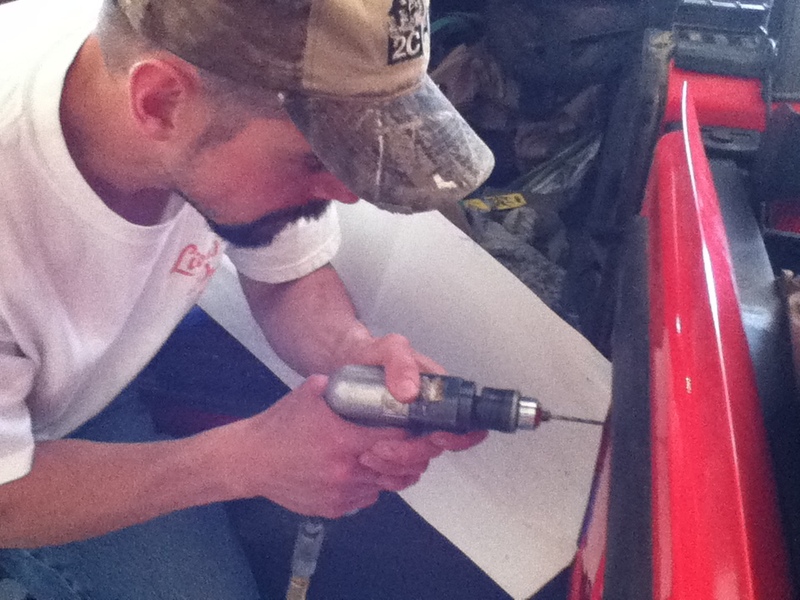 For the most part it is simply placing the pattern on the inside of the tailgate and DETAILED drilling. 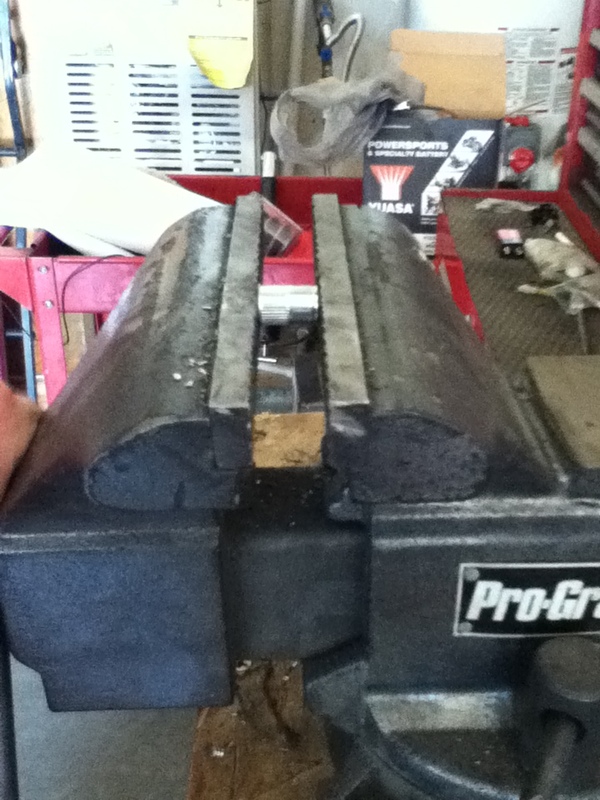 On my 2013 JK I had to ensure that we didn’t hit any of the spot welds and also be conscious of the degrees of metal thickness. The right side of the tailgate has more sheet metal than the left. Also our drill spot on the lower left was half thin and half double metal. 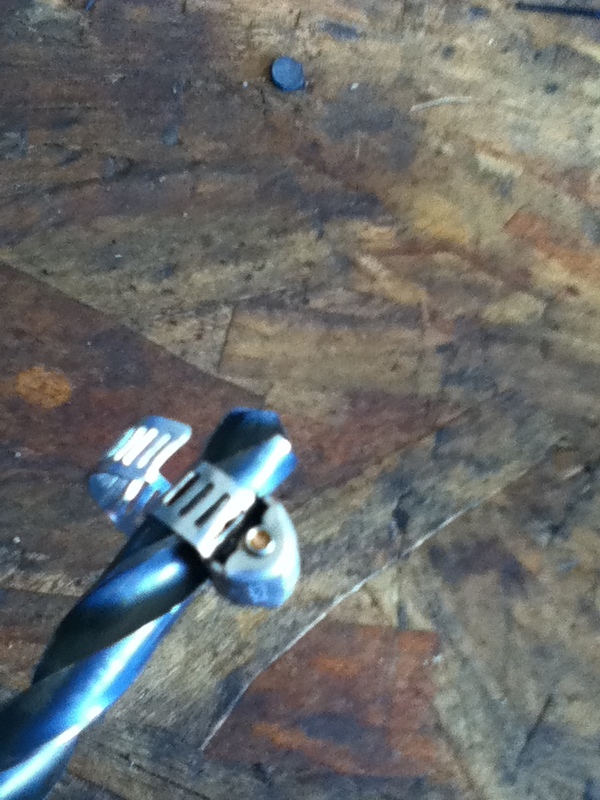 This caused the drill bit to walk a bit and tried to “egg” the hole instead of a neat circle. Fortunately I had Carl helping me and being the master of machinery he is, immediately detected the problem. He finished out the last hole using a die-grinder at low-speed. You should also be aware that if not careful- your drill bit can punch through the inside wall and leave a dent in the exterior wall. Teraflex has a highly informative video out there demonstrating how they did the install and specifically point this out. Recommend you check out their video as well. 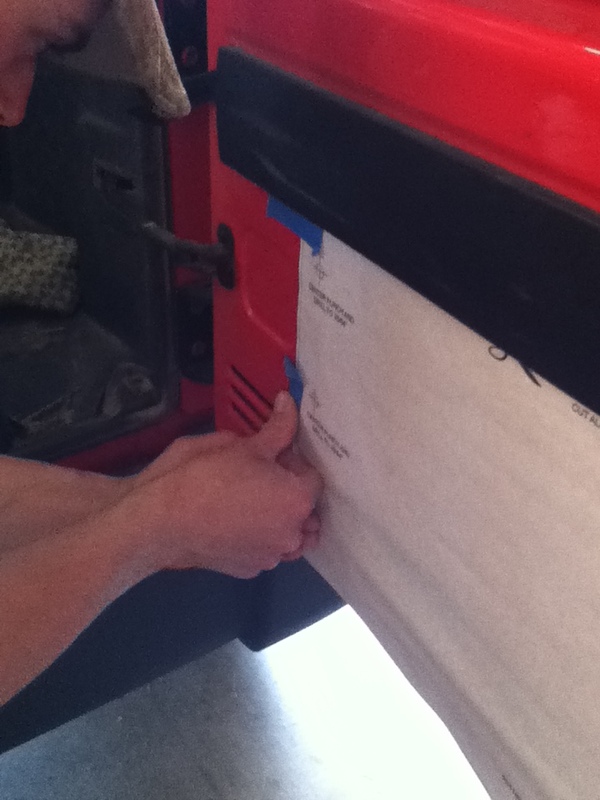 We didn’t have a tool to prevent the bit from going through- so we used a hose clamp around the bit. Worked like a charm! 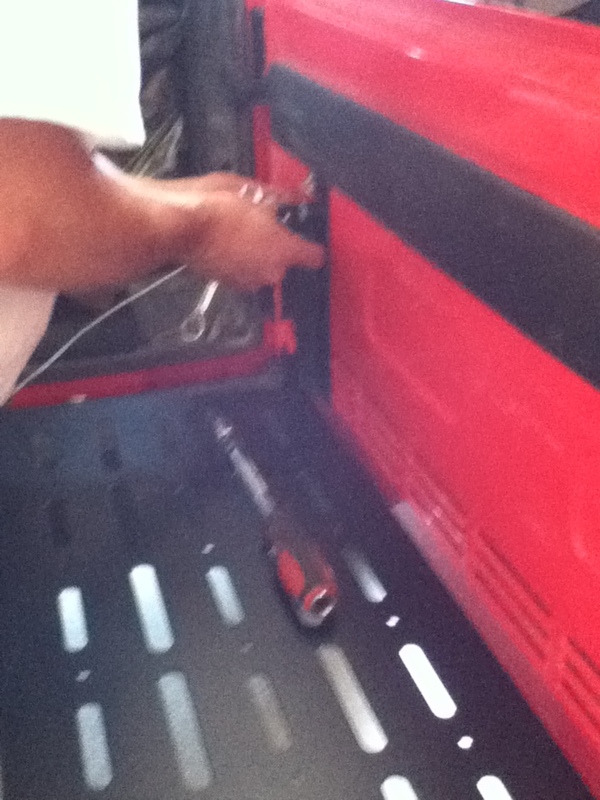 One issue we found on the thinner part of the tailgate wall was the Zert nuts getting enough traction to mushroom out. Zert nuts are similar to a rivet, except once installed they will accept a bolt or screw to hold an item in place. We pre-crimped the nuts so they would grab traction on the thinner part of the wall. If you do this—it is a VERY MINOR crimp. Try installing per instructions first. Once the nuts were in, it was just a matter of bolting the table onto the four nuts, doing some minor adjustments to the cable, and then off to make a sandwich. Teraflex does have a cutting board available and I recommend ordering your multi-purpose table with one. I’m watching every dime right now to get ready for our Oregon/Washington/Canada trip and Washington Overland Rally trip and even though they are not expensive, I opted to not to get one and use our cutting board out of the trailer. Wishing I had bought one now and after the rally will put that on my “to-buy” list. The rack will hold a stove and as mentioned above but for me, I’m not keen on this idea. 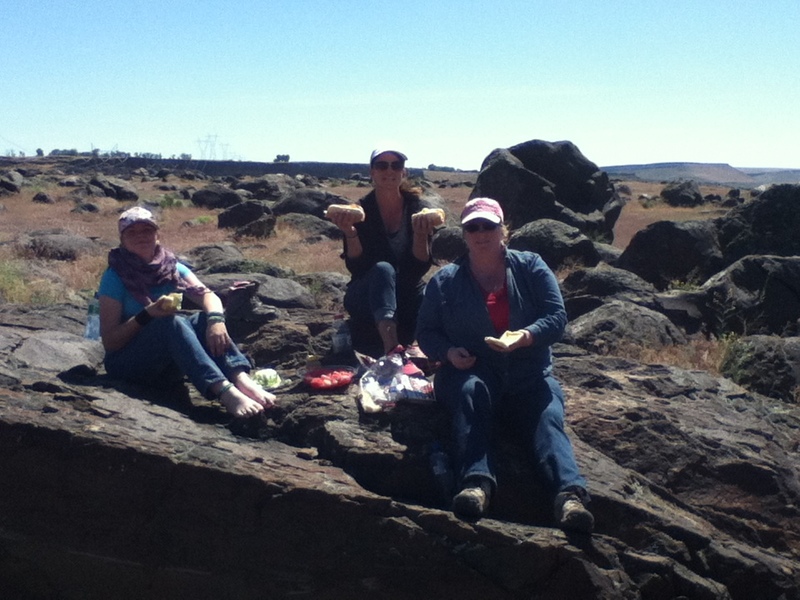 My first real meal came Sunday afternoon in the mining country of the Boise Mountains. I was making Tri-tip burritos using my two-burner stove and cast iron. My stove is a bit odd in the way it set up with portable propane bottles, and I wasn’t comfortable with the way it sat on the rack. Not the fault of the rack, I have an odd-set up is all. Tri-tip does have a moderate level of fat on the underside. While testing I had a small grease fire and even though nothing was damaged, looking back, with fire in close proximity to my Trasharoo and Rotopax gas can, I think I will move the stove to a safer location. In my second testing along the Snake River on Monday, the table was perfect for dicing tomatoes and cutting lettuce for my special back-country finger sandwiches and wedge salad. It also made a great platform in the evening as I was conducting a wine tasting complete with assortments of cheese. No I have not lost the rugged edge; I was simply providing my wife and sister-in-law with a weekend of back-country luxury. 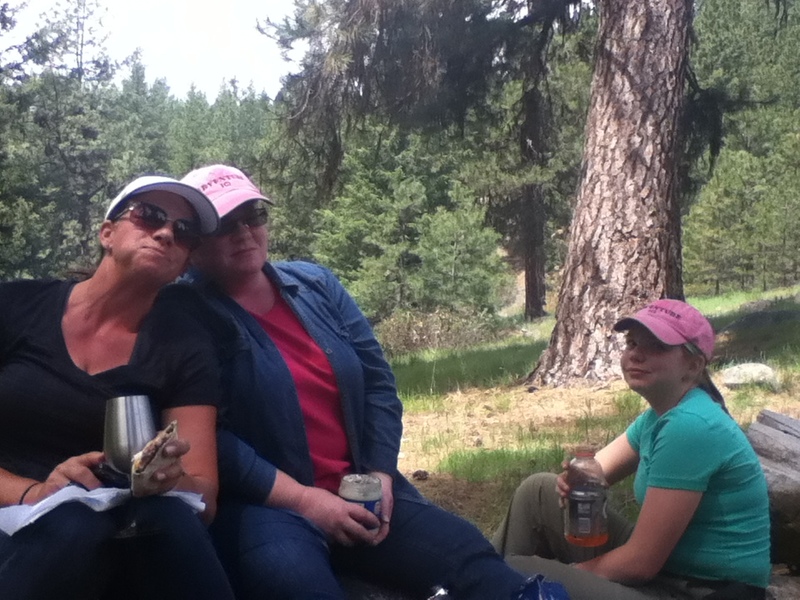 The well entertained ladies in the back country– Good lunch, warm fire, and me performing survival tricks! The Tailgate Table allowed me to prep all kinds of snacks and meals for these ladies in the back country…including a wine tasting! Now I just need a rack and awning for some shade! 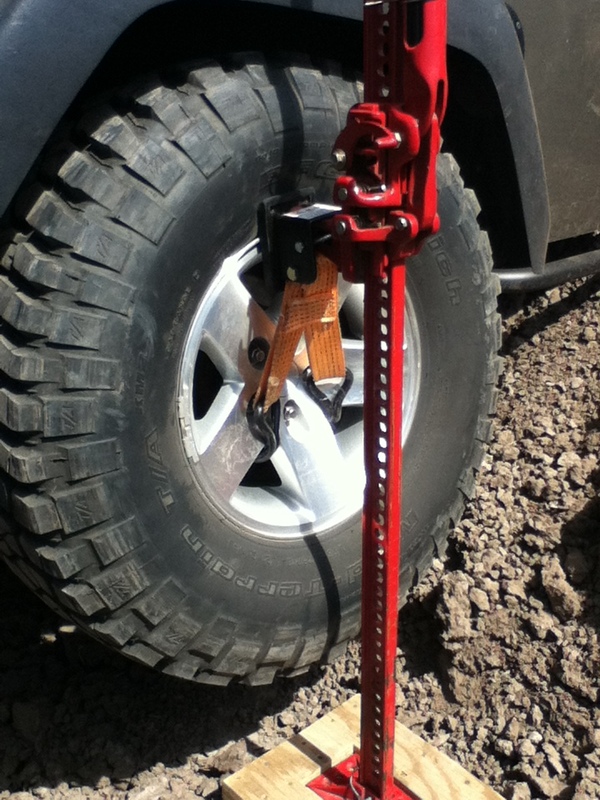 This is a well thought-out product and a must have for any Jeeper. Contact Teraflex.com or Quadratec.com to order yours! 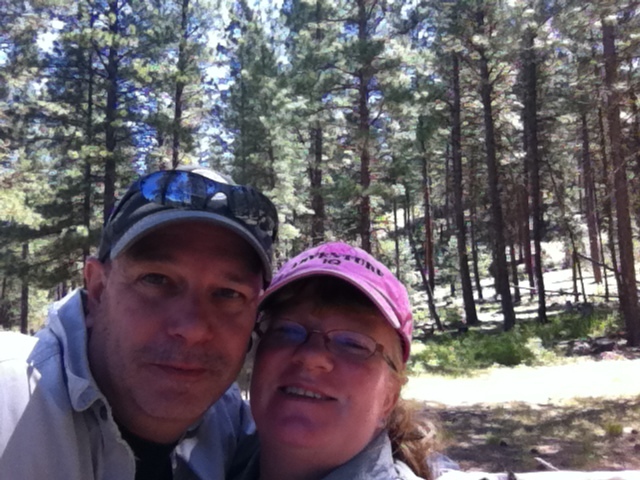 This entry was posted in Overlanding, Product Reviews and tagged 3 horse, adventure, adventure iq, adventureiq, by-way, byways, celebration park, chappel, expedition, food, gear review, glamping, idaho, idaho tourist, jeep, Jeeper, overland, quadratec, review, sawtooth, scenic, snake river, swan falls, table, tasting, teraflex, teraflex review, travel, western heritage, wine, winery, wrangler on May 27, 2014 by adventureiq. This was a skill I did only once in a survival training course I did about 20 years ago, and for some reason never carried on with it. Lately I have started looking at survival training as more of a hobby or enthusiast perspective and less of a needed skill in the back country. This has led me more into bushcraft and less survival, although the two are close cousins. Making a heat tolerant container that is waterproof can be a challenging. But I’m finding it to be a great way to relax and do something new in the back country. Bowl-burning is a process of shaping wood by slowly burning it with coals from your fire. The process is really burn, scrape, repeat. After controlling the burn using coals you then scrape away the charcoal. I’m working on a couple of bowls to boil water in right now, but different types of wooden tools can be made with this method, including spoons and even canoes. I’m using pine red-hot pine coals but really coals from hard woods will burn longer and hotter than soft wood coals. If doing this at Ft Backyard, you can also use charcoal briquettes for the grill. To start select a piece of wood that will be your bowl. 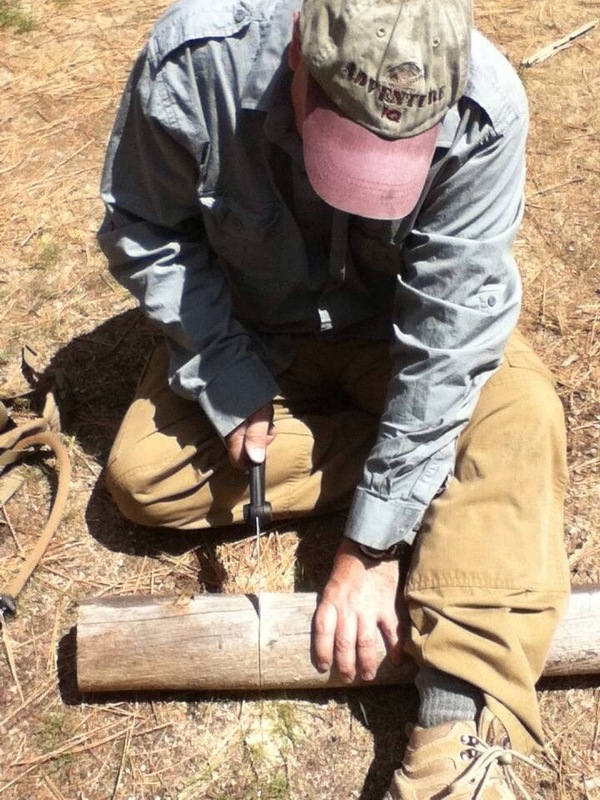 In school I used a pine round that had been slit down the middle by someone with an axe or hatchet. On my current project I am using a 5″ diameter wood round. Once your coals are ready, carefully begin taking coals from the fire with tongs. Elitist use wood, I admit to stealing a set of metal tongs from the kitchen. 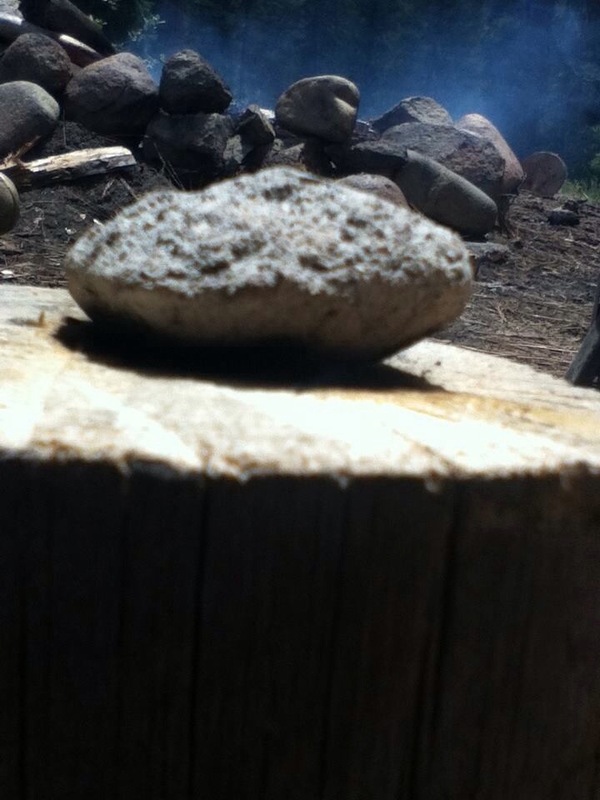 Place the hot coals on a chunk of wood. Blow on the coals lightly. You can use a straw or reed to focus the air, I am using surgical tubing from my slingshot. It takes a few minutes for the wood to begin to burn. I try to not let the coals flame up, this is extra heat and can cause the wood to crack. Be careful to not let hot coals get in your eyes or drift onto you. I burned a hole in a good pair of pants this weekend doing this. 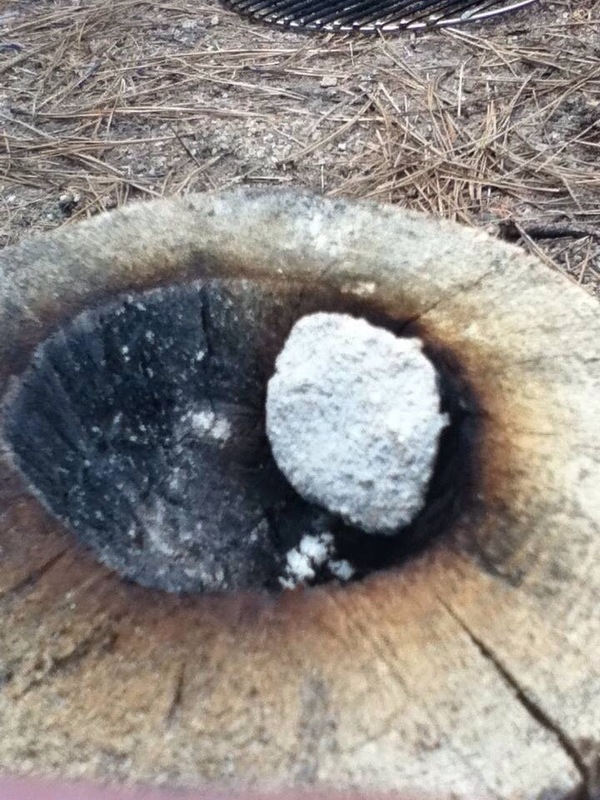 I cycle my coals through when I am making the initial burns. I let any burning charcoal / glowing wood burn for a bit and even use the embers to help shape my bowl. 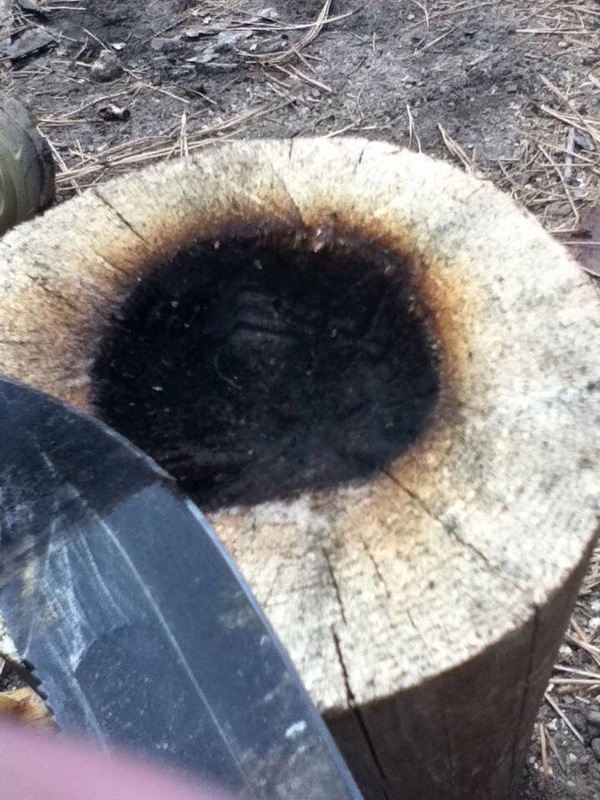 Once the ember does go out in the walls of the bowl, I then use my knife, a shell or stone to scrape away the char to reveal the browned wood underneath. For better control and to keep random spots from burning, wet the area or smear damp mud or sand over the area that you are trying to protect. It takes several hours, but Keep repeating this burn-and-scrape process until you have burned out the bowl to your satisfaction. Its an interesting skill and there is the satisfaction of making your own gear. You can actually boil eater using hot rocks, but more on that later. This entry was posted in Adventure Aggregate, Survival on May 12, 2014 by adventureiq. We were in the woods this weekend practicing skills and learning or refining techniques for many of the things we teach. I was working on making a bowl with hot coals and a freshly cut round, and Abby worked on her fire skills. I decided to have Abby put up a tarp. This is something I have had her practice several times. It looked horrible. Stakes came un-stuck, the thing flopped in the wind, and if it had rained, she would have been soaked. Teaching good tarping techniques is challenging at best. First, it is time consuming. Second it’s not a “cool skill” like making fire. Students get bored quickly and instructors get frustrated. However, it is a critical survival skill that gets overlooked. For one reason or another, building a shelter doesn’t appeal to most outdoorsman. Most (mistakenly) think they can build a shelter that would sustain them in bad weather. I can attest to a good shelter saving my skin on more than one occasion. A good shelter will keep you out of the rain and snow and is a fallback if everything else goes wrong, such as inability to get a fire going. We have raised kids in an era where building forts is no longer cool. Even if it was, access to trees, roaming around after school on abandoned lots, and the over-protective nature (as compared to 30 years ago) puts kids in a disadvantage when it comes to constructing shelter. I don’t even teach it in most of my seminars and shove off to Dan or Travis at our day camp. To really understand how to tarp well, you have to put one up on a regular basis. You have to do it when there is rain and snow. I had my best tarping students when I was an instructor for ground combat and survival training in Germany (where it always rains) and later at Ft Dix (where it rained and snowed). Here students were motivated to stay dry and comfortable and I was motivated to not write up a safety report for a kid going into hypothermia. Here is where I failed. I have had Abby set up her tarp using neatly set T-Post to simulate trees. Then she goes to the field where the trees are not so neatly set up. Different sizes, spacing, shapes, etc. I have had Abby set up on flat ground, without 4 inches of pine needles or loose top soil. I have had Abby set up with nice tent stakes and not make her own using her knife and thumb-sized pine branches. I admit, in my own courses where I am often asked to teach at a school, or park, or other “pristine” location I have had to come up with my own simulated trees- thus the T-Post. I also admit that teaching students in the perfect conditions has been part of our practice. But this is changing as of today. Abby’s tarp training will get re-launched immediately. She will learn how to cut her own stakes and putting up a tarp will be a regular routine. I will carry this over to my classes and when we have to drop T-Post to simulate trees, they won’t be so evenly spaced. Trees will be planted at our base camp for the purpose of training tarping. It will take a few years to grow- but we need the landscaping anyway. Tarping and shelter building will return as a vital skill to all our training. All of my instructors along with myself will add this to our skill practice time- and will explore new ways to teach the tarping and shelter building skills on a regular basis. This entry was posted in Adventure Aggregate, Survival and tagged adventure, exploration, kids. 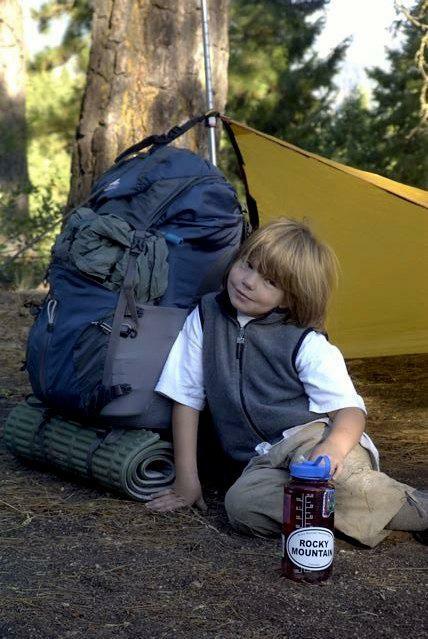 AdventureIQ, outdoor, shelter, skill, survival, tarp, tent on May 12, 2014 by adventureiq. 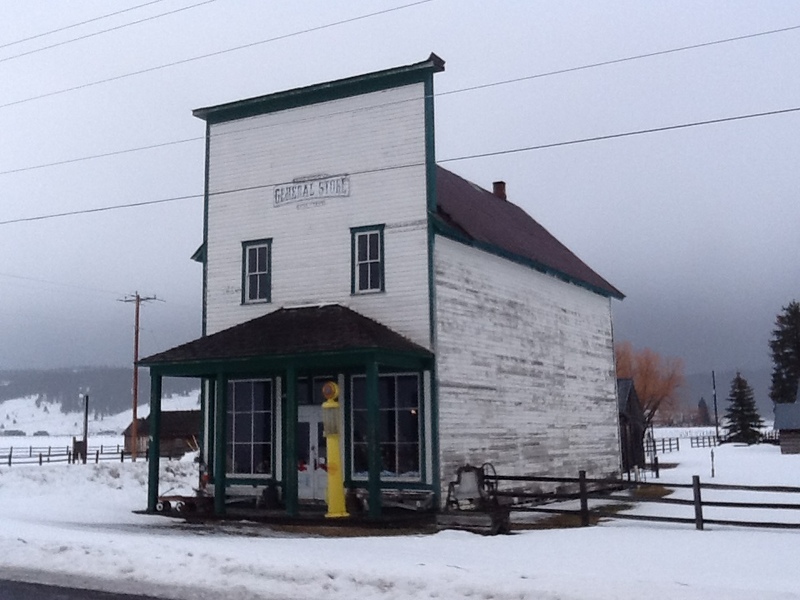 This is the time of year to hit the scenic byways of Idaho. These are great one-day and even multi-day trips that most vehicles can handle. If you have been a steady reader of the blog or the podcast, you know we love to hit these 4-wheel adventures. Idaho has so much to offer. 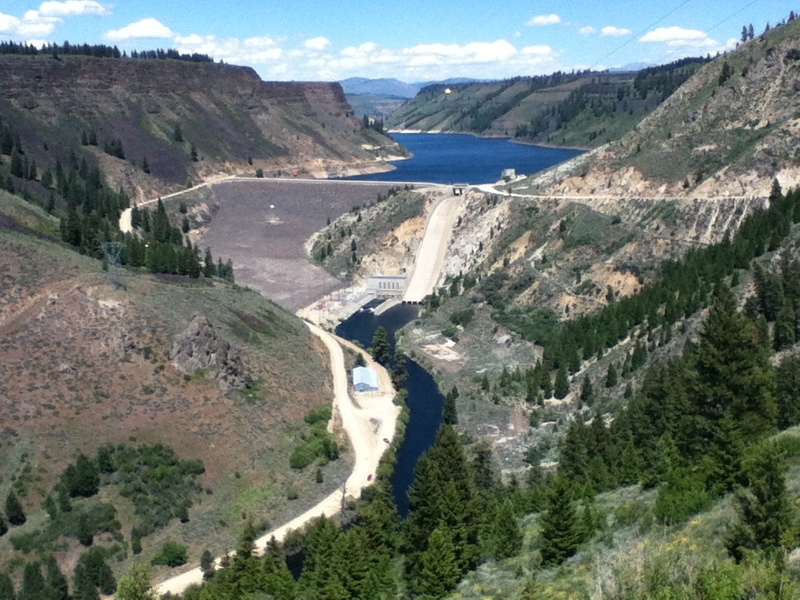 When researching, make sure your first stop is to http://www.visitidaho.org/scenic-byways/ where you can order your free travel guide. While the guide lacks many of the details to plan out your trip, it does give you enough of a view to pull out the map and do some planning. But before you head out- think of how you pack for the trip. 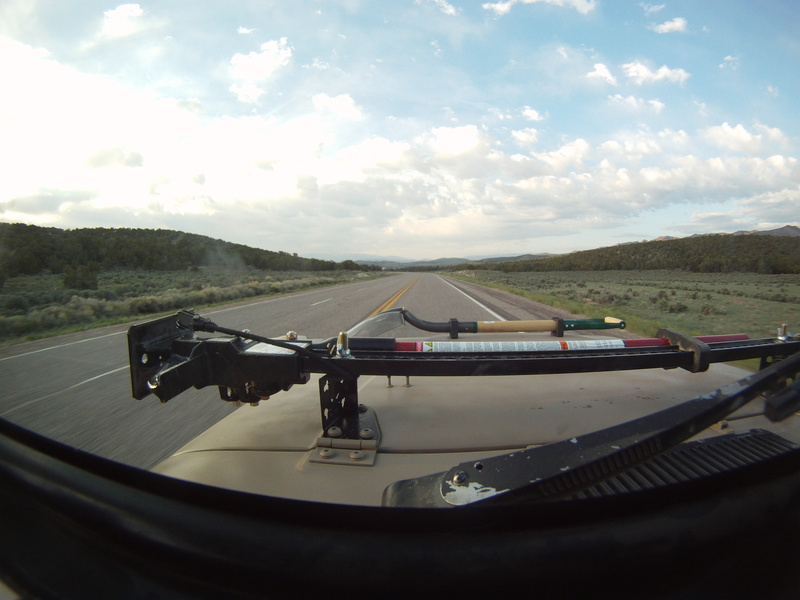 Remember Idaho’s byways range from rural to remote. 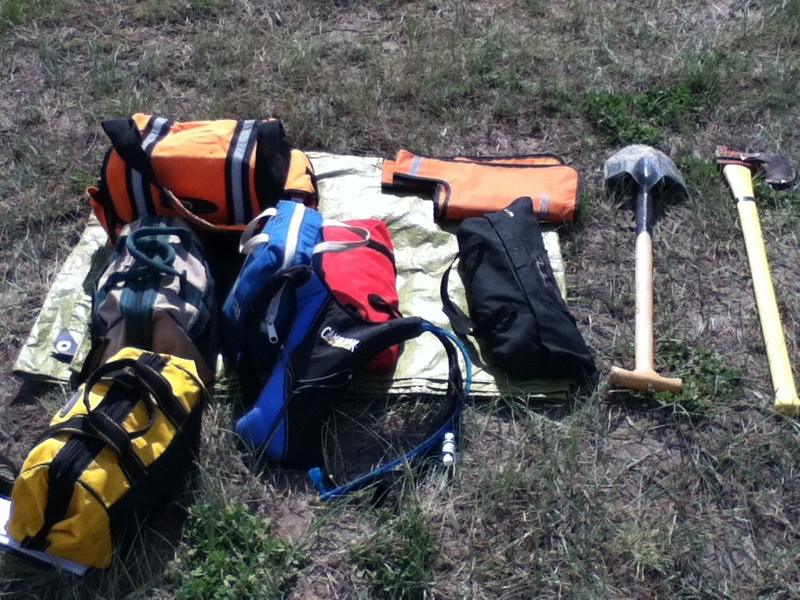 Be sure you have any emergency gear packed for the trip such as first-aid, good communications, extra water, tools, etc. Some of these byways skirt alongside backcountry areas so help will not always be a phone call away. If you have a breakdown or other emergency- you need to be prepared to stay for awhile. In my other article I briefly outline what we take on trips such as the Owyhee Backcountry Byway, one of the most remote byway trips in Idaho. No matter where you start out from, there are great options for awesome scenery. Be sure to pack your camera and if you are really a shutter bug, pack those once-in-a lifetime lenses you rarely pull out. This last winter I had my dad along Sawtooth, Payette River, and Western Heritage byways where he had opportunity to shoot pics of Antelope, a young brood of Sand Hill Crane, and a few other hard to get close to animals. In addition, great scenery abounds on the byways so packing a tripod and a wide angle is a must. Pack extra batteries, throw in a dust cloth for the lenses, and maybe an extra memory card. There are even opportunities for the iPod photo enthusiast so keep your car charge handy. Stop off at the small museums, wineries, and state parks along the way. There are great stops along the way like Craters of the Moon National Park along the Peaks to Craters Byway or Huston Wineries along the Snake River Byway. 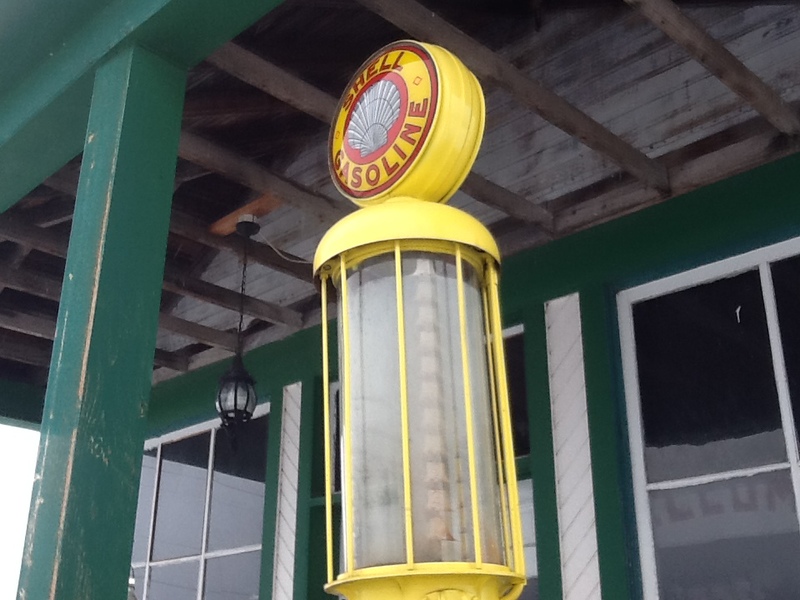 Most have great mom and pop diners for lunch, keep cash on hand for some of the better stops. Better yet, throw in your own picnic. We usually throw in lunch for the day and stop for dinner or start off with breakfast in a non-chain dive. I love driving but need a break from hours of windshield time. I like to find an area where we can park and either pull out sandwiches or I can do a quick burger or two on one of our portable grills. I even throw in a few lawn chairs to relax in. 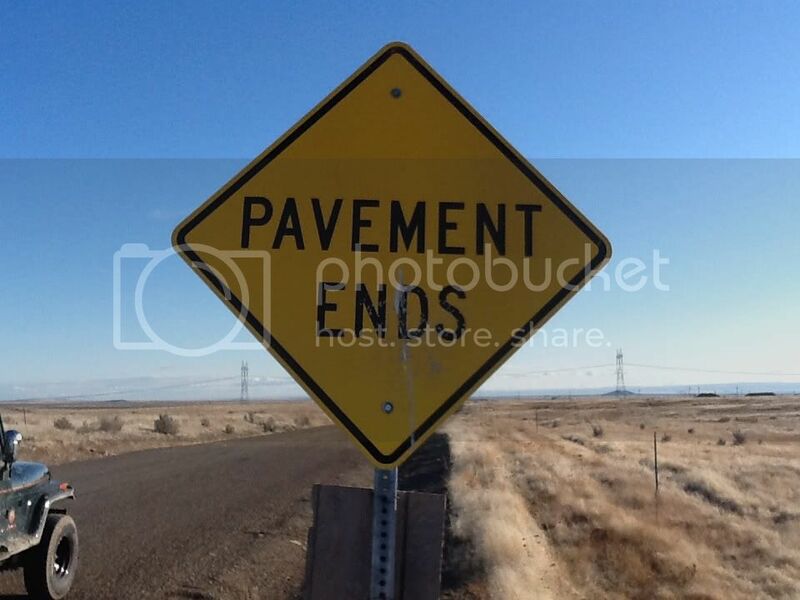 There are 30 official byways in Idaho. I recommend creating a special journal for the adventure, and log each one with thoughts to scribe, postcards, pictures, museum tickets, etc. 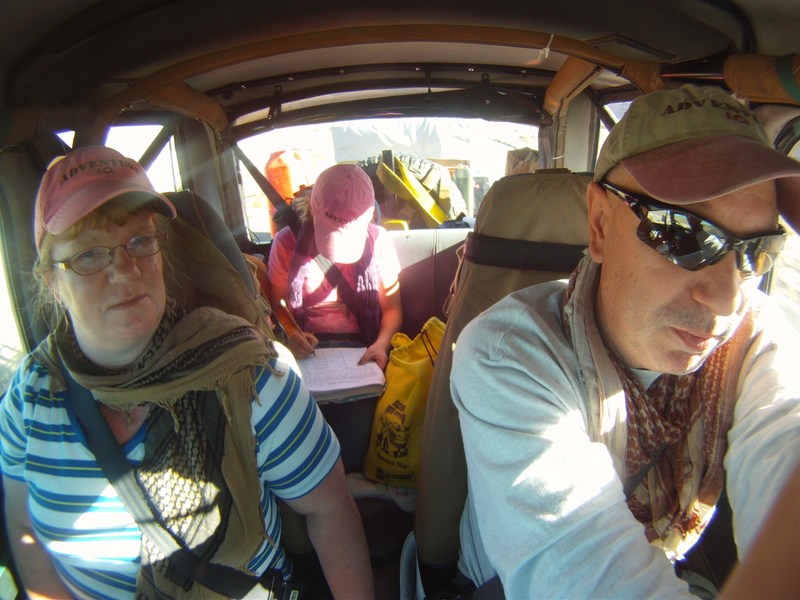 Sometimes we will take a few days to do one or more byways- and camp along the way. This is where our home-built Explorer box designed by Compact Camping Concepts is a huge benefit. And if you see us on the road out there-stop and say hey! We just might have a sticker or two for you! 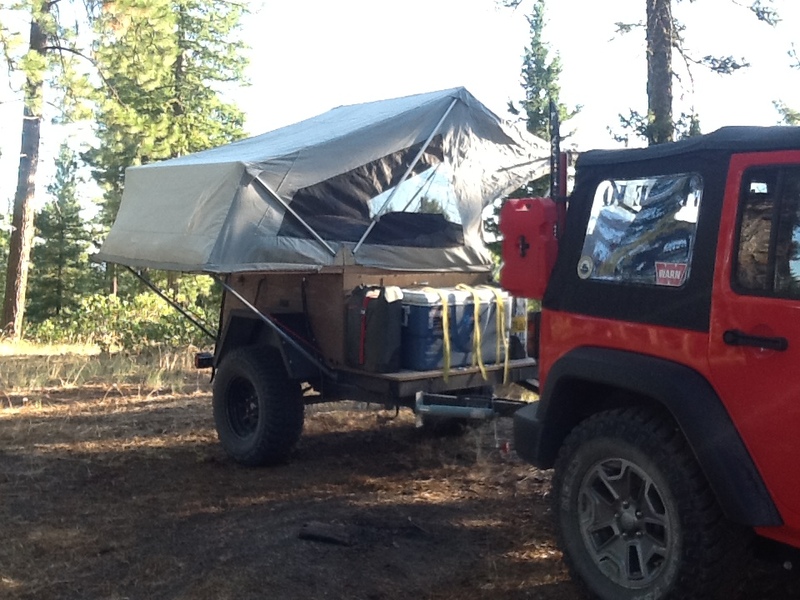 This entry was posted in Adventure Aggregate, Overlanding and tagged 4x4, adventure, adventureiq, aev, at, back country, backcountry, bonners ferry, border crossing, by-way, byway, canada, compact camping concepts, expedition, explore, expo, glacier national park, huckleberry pie, idaho, idaho DOT, jeep, jk, montana, northwest overland rally, nwor, overland expo, photo, ROVE, scenic, shutterbug, travel, washington, wrangler on May 12, 2014 by adventureiq. In a workshop a few months back I was blown away as a group of ladies joined in solidarity that in a survival situation they would not harm any animal. A bit baffled I asked why. The answers ranged from not wanting to harm another living being to thinking they just couldn’t stomach the idea of killing something and then eating it. None of them were vegetarians, all were married, and all but one had children. Going to the dry erase board I asked and then wrote the names of their family members. I then went to my pack and tore several blank sheets of my journal and handed each one a page. “This is one of the last pages you have left in your journal; please write down what I tell you to”. The letters looked something like this. I am so sorry that I got into this situation. I wish you were here with me to make this easier. My lips are chapped and I can feel every ache. Please God, tell me what I did to deserve this. I have done what I thought is right and in good conscience. My body is growing week, my stomach aches, and I hallucinate. I so want to be in your arms again. I think of the day we met. I think of each of our children and when they were born. I remember the Birthday celebrations, the trip two years ago to the mountains, and the second honey-moon we never really got. Darling, you mean so much to me, but I am sorry, but these animals mean so much more to me. I cannot take their life to save mine. I regret to tell you, they are more, much more important than you and the children. Please let all those I love know I have not forgotten them. You make it back no matter what you have to do and no matter what you have to sacrifice. You make it back for those you left behind. When it comes down to it, no animal, bird, plant, tree, shrub, whatever is more important than you or those you are trying to get back to. You need to first make the decision that in a situation, you are going to do whatever it takes to make it back alive. Second, train now. Abby ripped open her first bunny at six. In my survival camp, kids get to see first-hand what it is like to field dress a game bird. In some of my advanced private classes we have killed and eaten chickens and soon, goats to get people in the right mindset and to understand the skills needed to properly prepare game. Love animals, respect life, but come back home to those who love you no matter the cost. 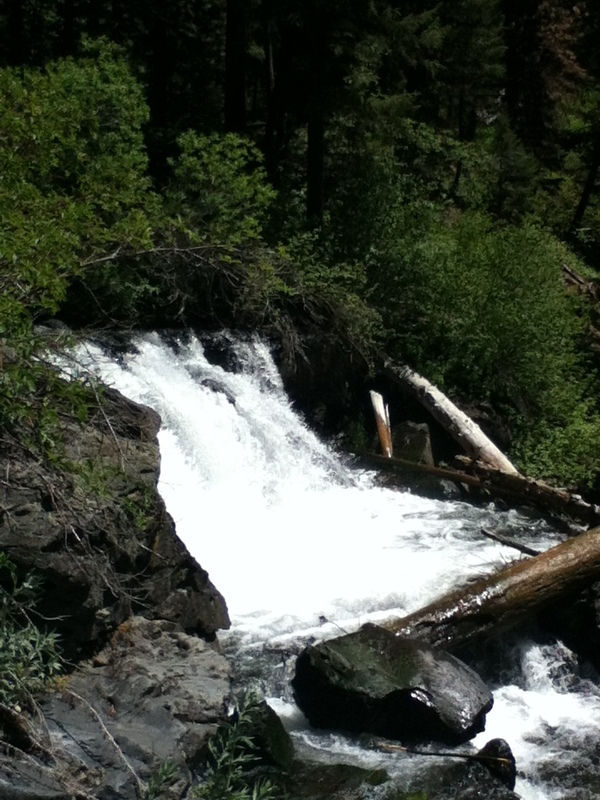 This entry was posted in Adventure Aggregate, Survival on May 9, 2014 by adventureiq.